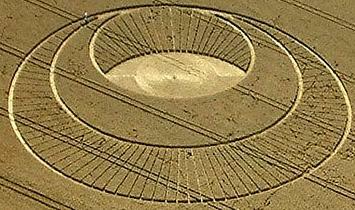 There is also often the 3 in a crop circle. In the six you see that they always double till the pole shift. This may be the sign for us to watch. Until we recognize this, we will have 2-3 days that have passed. The 3 birds doubling in size could mean mankind has 3 days in which to get to safety, a 3 day limit during which they can do their normal job. 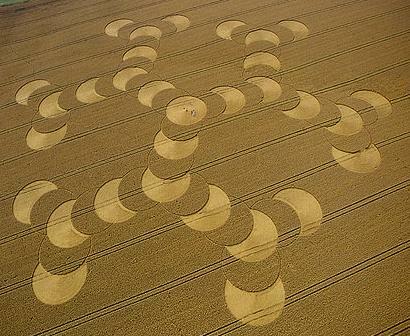 Indeed, a rapid increase in 3 steps is a recurring theme as is the 6 which has shown up in numerous crop circles over recent years. In the Morgan Hill circle the 3 seems to end in a grip on the planet in the center, a squeeze, no escape. 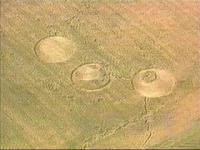 in the Walkers Hill circle, the 3 seem to be one, telescoping in size. In the Horicon Marsh circle, the 3 march in line, increasing in size. 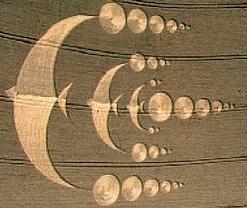 Converging, degree of occultation, and telescoping of 3 into one seems to be the theme of the North Down circle..